Deanna Kingston is a descendent of the King Island Native Community. She was born, raised and currently resides in Oregon and has worked with the King Island Native Community for more than ten years. In that time, she has documented kinship and namesake relationships using archival film; interviewed Elders about their trading and kin networks in Siberia and elsewhere on the Alaska mainland; documented change in subsistence and other cultural activities over the past 70 or more years; researched the King Island wolf dance; recorded the traditional knowledge about walrus from King Island walrus hunters; found archival photographs of the village for a future exhibit at the new King Island offices and meeting hall in Nome. She is currently engaged in a four-year National Science Foundation project to document place names, stories, subsistence sites (both plants and animals), and old village and cemetery sites. Dr. Kingston received her PhD in Anthropology from the University of Alaska Fairbanks in 1999; an MAIS in Cultural Anthropology from Oregon State University in 1993; and a BS in Science Communications from the University of Portland in 1986. Dr. Kingston teaches anthropology at Oregon State University. Her Master’s focus was on Alaska Native and Native American cultures and issues. 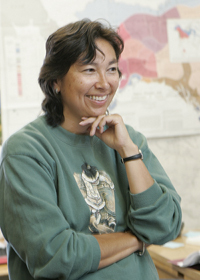 She is the chair for eight graduate student committees, two of whom are Native Americans; two others are married or engaged to Native Americans; two are collaboratively working with Native American communities in Oregon and California; and the two who are working on research pertaining to natural resources issues in Alaska and Oregon. She currently serves on the National Science Foundation’s Office of Polar Programs Office Advisory Committee and also on the SEARCH (Study for Environmental Arctic Change) Responding to Change Panel. Dr. Kingston has participated in numerous workshops and conferences including “Designing an Arctic Observing Network” in Copenhagen, Denmark; an international conference on indigenous knowledge at Pennsylvania State University; and a workshop on working with Arctic communities at the International Arctic Social Science Association meeting sponsored in part by the Alaska Native Science Commission. She is cognizant of efforts both in the circumpolar Arctic and in the Pacific Northwest to consult, respect, and collaborate with Native American/indigenous communities, particularly when it comes to their knowledge of the environment.